Sleepy Peach is a collaborative clothing brand created by Eric and tailored by Juliet. This brand deals exclusively with bright pastel colors specifically curated to spark up anyone's wardrobe. The brand is based in Long Beach, California. It launched in 2018. All designs are original cut/sew pieces sourced in sweatshop-free environments. 1. When do you restock your clothes? We try not to restock. When it's gone, it's usually gone forever. 2. How do you size your clothes? Although we create our products from scratch, we get our measurements from typical men's Hanes fits. Hanes is one of the most popular shirt/sweatshirt manufacturers in the world, which is why we measure our clothes to replicate their measurements. Therefore, if you're typically a medium size, you should order medium. Returns are a sticky subject. We'll pay shipping for your return item if it's a mistake on our end. You'll have to pay shipping to return your item if you're being picky. The most common returns occur when the size of the item is incorrect. Don't hesitate to email us or contact us via Instagram if you have any questions or concerns! 4. How long will it take for my item to ship? We are a tiny two-person crew. An item typically takes 1-3 days to ship. Most items will arrive to your doorstep within the week if you're from the USA. Items to Canada and Mexico take about 10 days, and items elsewhere will take up to 2 weeks. 5. Do you ever send free clothes? 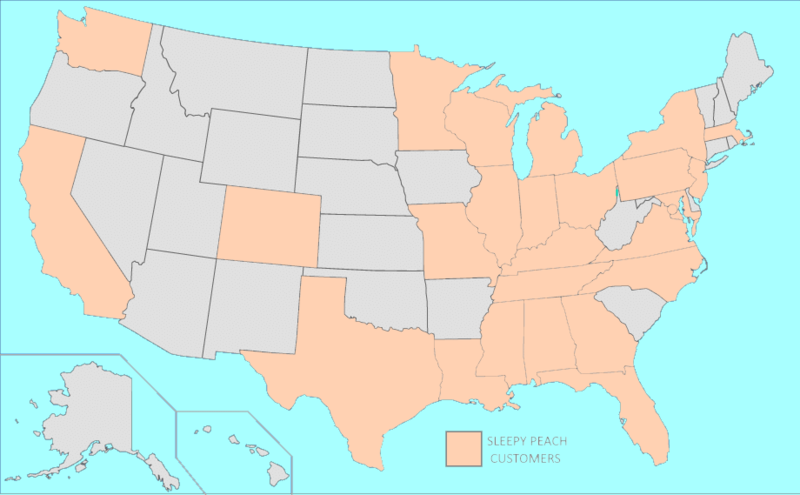 Bonus: TF is a "Sleepy Peach"? Our brand name doesn't really mean anything. We just like how it rolls off the tongue.